It’s the best Monday in all the Mondays! Er, what? Monday and best in the same sentence? I know, but I have my reasons. 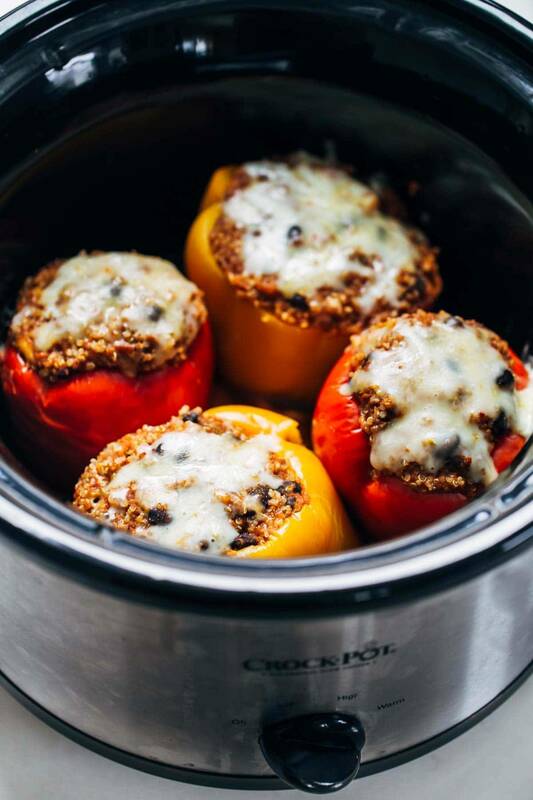 Let’s just pause for a second and add these crockpot stuffed peppers into the picture of your day. 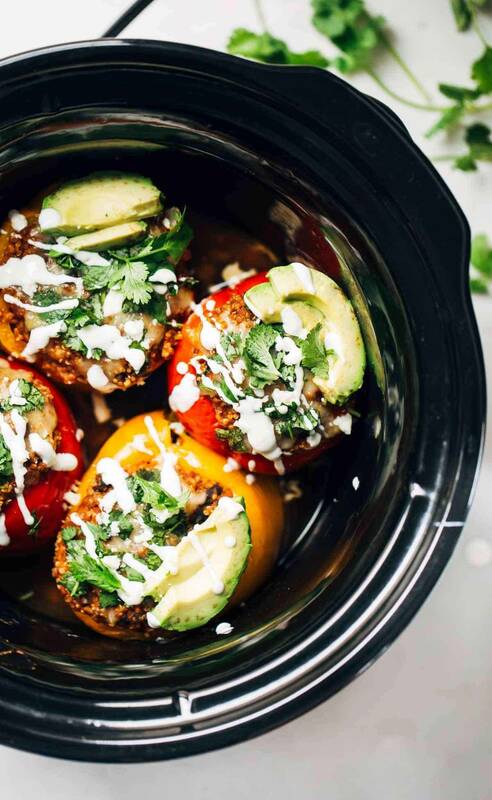 These Quinoa Black Bean Crockpot Stuffed Peppers topped with cilantro, Pepperjack cheese, sour cream, and avocado are making Monday dinners everywhere just a little more wonderful. The prep – if you can even call it prep – is incredibly easy, like any good crockpot meal should be. No chopping, no pre-cooking, nada. You can top them with all your favorite things in the worrrrrld, which makes them ultra pretty for something that’s coming from a crockpot. The Minnesota Twins! Well, not so much the Twins, like, actually playing baseball, but more like me going to the Twins home opener at Target field this afternoon to a) sit in the perfect, golden spring sun, and b) sample all the best food in the baseball park lands. Seriously, Target field knows what kind of food the Minnesotans love and they deliver. The food choice is always a huge decision for me when we go to games. There are so many good options that you can get complete analysis paralysis, and worst case scenario – you make a sloppy, poorly planned food order that you regret two bites in. UGH. The pain. Minnesota friends – anyone else going to the opener today? Also: I would not be mad if you gave me all your best food recommendations for Target field. TEAMWORK. Final thing that’s making me happy on this sunny Monday: our Sage girl. We visited three dog parks over the weekend (okay, I just literally cringed – we are SO overboard as dog parents) and Sage’s favorite part was sitting on the bench and doing The Lean for kisses and hugs. She’s an outdoorsy one, that Sage. My girl and I also already had a few lovey snuggles this morning to bring in the week. Do they have a name for this disease? Can’t stop won’t stop. Your comments, emails, pictures, welcome notes, and encouraging tips in response to The Sage Post were just so fantastically uplifting. My heart melts. I HAVE read them, but I haven’t had time to respond – cause, like, hello? three dog parks in one weekend? we’ve been obnoxiously dog-busy – but I will get to them in the next day or two. If you want to see more of Sage on Instagram, please find @sages_advice – it’s an account that Bjork made for Sage Pictures and Sage Wisdom. Bjork has never ever wanted anything to do with Insta until now – to say I’m smitten with these two and the fact that they are now on Instagram would be a majorly major understatement. Okay, crockpot though! 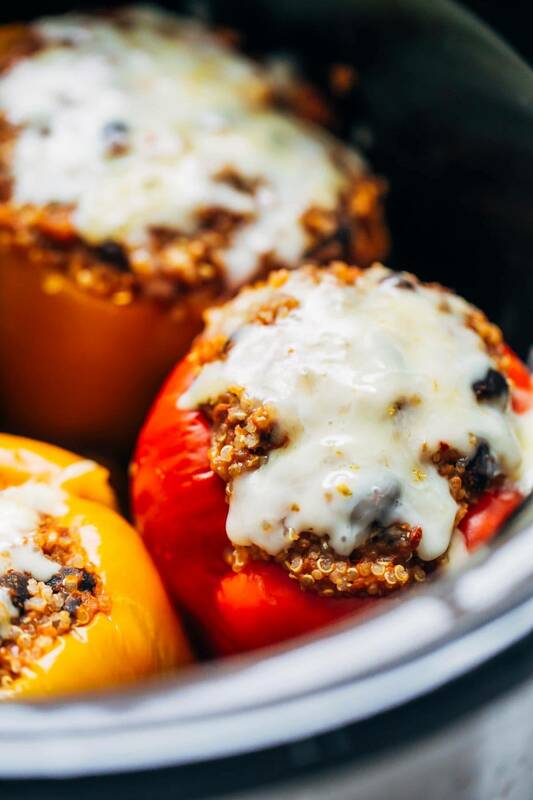 The quinoa black bean crockpot stuffed peppers! I hardly even talked about them because LIFE, but they are delicious and I think you’ll love how easy they are. The peppers are stuffed with a combination of quinoa, black beans, Pepperjack cheese, enchilada sauce, and spices – all easy pantry ingredients that can be whipped together in a flash. Then you top them with everything <— that’s an order. You must do it, good people of the world. They make the perfect lunches for the week and they are an excuse to incorporate chips and guac into your meals. Which is always always always a good thing. So bring it on, Monday! I feel good about this one. 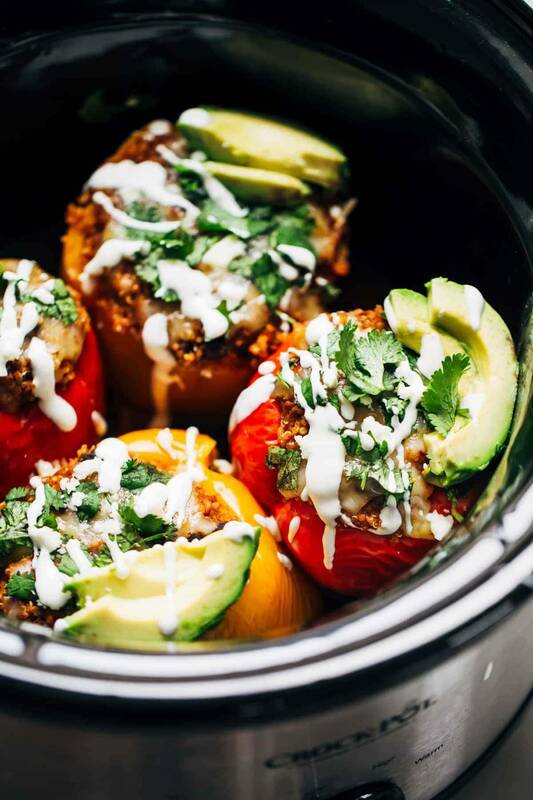 These Quinoa Black Bean Crockpot Stuffed Peppers can be made with or without meat – all with simple pantry ingredients! Minimal prep, awesome taste. toppings! cilantro, avocado, sour cream, etc. Cut the tops off of the peppers and scrape out the ribs and seeds. Pour 1/2 cup water into the bottom of a crockpot. Place the peppers in the crockpot so they’re sitting in the water. Cover and cook on low for 6 hours or high for 3 hours. Remove lid, distribute remaining cheese over the tops of the peppers, and cover again for a few minutes to melt the cheese. Serve topped with anything you like! These are also great with chips and guacamole, believe it or not. My crockpot only fit four of the peppers so I had to bake the other two in the oven – I just put some water in the bottom of the pan, covered with foil, and baked for about 45 minutes at 400 degrees. You can also keep the leftover filling for a day or two in the fridge. I also made a variation of these with spicy ground sausage (I left out the refried beans and added a pound of uncooked sausage), and they were equally great! Bjork liked those ones better, being the meat guy in the family. I’ve always made stuffed bell peppers in the oven with rice. My wife recently showed me Quinoa and I’m a pretty big fan. This recipe looks right up our alley. Thank you very much for sharing!! I’m definitely going to try this out but with a little modification to the spices. Also, is that nutrition facts label for the whole meal? If so how did you make it? I would love to know! My wife introduced me to quinoa as well, and I’m pretty happy with it as well. I still can feel manly with the black beans in here too as there is no meat. Stuffed peppers are pretty tasty. Looks like you’re really enjoying Sage Lindsay. Dogs are awesome, they have all the common sense you need. Thanks Lindsay! We made these yesterday with ground turkey and a few other ingredients which i’ll post sometime later this week. Thanks so much for the recipe and the link to the tool! Glad to hear it Arthur! While these sound delish, my husband won’t eat a meatless dish. Could ground beef or turkey be added to these? If so, should the beef/turkey be cooked first or put in raw? My dad refuses to eat meatless meals too, what a pain! I would say you definitely want to cook the meat beforehand. Although it might cook all the way through, it takes too long for the slow cooker to reach a safe (hot enough) temperature, so the raw meat might end up in the danger zone (41-135 degrees F) for too long. I’ve made roasted stuffed peppers with both ground beef and ground turkey, so either should work! These stuffed peppers look so good!! I love that it’s an easy crockpot recipe too! Definitely making these soon! I love stuffed peppers but have never tried them in the crockpot. I am definitely all over these! I love things that I can throw in the crockpot so these are great. Also all that food you listed is making me hungry! Sounds like some great options. Thanks for sharing about the IG account; I will have to check it out. Glad you had a great weekend! Thanks Erin! Hope you like the instas! This sounds sooo good! And the pictures are gorgeous! This is genius. Uh, crispy belly bacon with jalapeno jelly & vinegar slaw? What does that magical sentence even mean?! It sounds like that’s the winner. Jalapeno jelly and belly bacon (!) all the way. So glad you guys are loving being dog parents! I have two kitties and I’m obsessed with them as well. They are just so sweet and give so much love – sounds like Sage is exactly the same 🙂 Now following Sage on Instagram as well! What a picture perfect moment! And these stuffed peppers are pretty sweet too. Looking at that picture of you two on the bench…I’d say Sage is as in love with you as you are with her. She’s smiling! Oh…and the peppers look pretty darn yummy too. That’s so sweet of you Stephanie! 🙂 Thanks! I have always loved bell peppers stuffed with vegan foods as they are always satisfying and delicious. Have to try these out soon. So happy you have Sage with you now so keep on enjoying all the dog parks. Hope you have a wondrous week always! Thanks Peter! We are loving it! Yum, I love stuffed peppers! And I don’t have to cook the quinoa in advance? Winner. Enjoy the Twins opener – I live in Seattle so I’m a Mariners fan first, and I was at their home opener last week – so much fun! But the Twins are my 2nd team from my time living in the midwest. Target Field is really nice! Enjoy! We love Target field! 🙂 Unfortunately, the Twins lost, like, major lost… but Target field and all the good food was still fun. Okay, you’ve gone and done it! You’ve made stuffed peppers in the crockpot AND added black beans to them. WIN and WIN. I am totally loving this meal. Congrats to you guys on the new addition to the family! Absolutely loving these pictures of Sage and these real tidbits on life. Thanks Marzia! 🙂 appreciate that! Oh my gosh, those look amazing and would be perfect for busy weeknights, like tonight. We have 2 different Kung Fu classes and then baseball practice. I have to share my favorite Slow Cooker Cuban Black Beans. They are amazing and you can eat them with all that yummy stuff like sour cream, lime juice, chips and guacamole would be great with them too. Hey there… these peppers look fantastic!!! I also want to thank you for putting up the Nutrition Facts. You are one of the few that do that, and it’s highly appreciated. Will try the peppers, too. Thanks! After a weekend of food gluttony, a meatless crockpot dish is very much in order! Love that most of these ingredients are already in the pantry too 🙂 Putting on the menu for tomorrow’s din – PINNED! 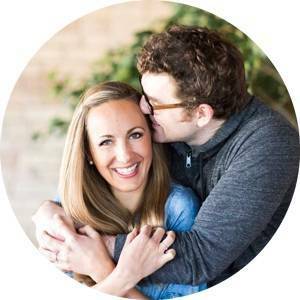 Your blog is quickly becoming a favorite of mine! Thank you for all you do 🙂 I cannot WAIT to add this recipe to my list this week. YUM! Xo. 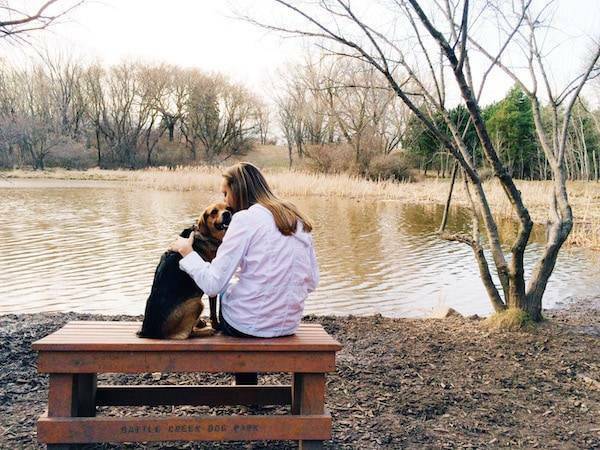 3 dog parks – in ONE weekend??? I am impressed!!! Sage must have felt like she hit the dog-owner lottery jackpot! I’m in love with that last photo – the avocado looks diviiiine. Totally doing this later in the week, I have most of the stuff already and this looks and sounds both healthy and delicious! I love stuffed peppers! I am actually make them for dinner tonight, a pizza style one. These look great, my husband loves black beans and would really enjoy this!! We love stuffed peppers! I used to make these about once a week with brown rice for me (before quinoa became popular) and chorizo for my husband. I love them with chipotle chili powder, avocado,and lime zest and my husband likes tortilla strips and habanero salsa on his! We love all these ingredients and I will make this soon! Mostly though, I wanted to say I love the picture of you and Sage. The body language of both of you says it all. Yes! I always want the crockpot recipes to be as easy as possible. 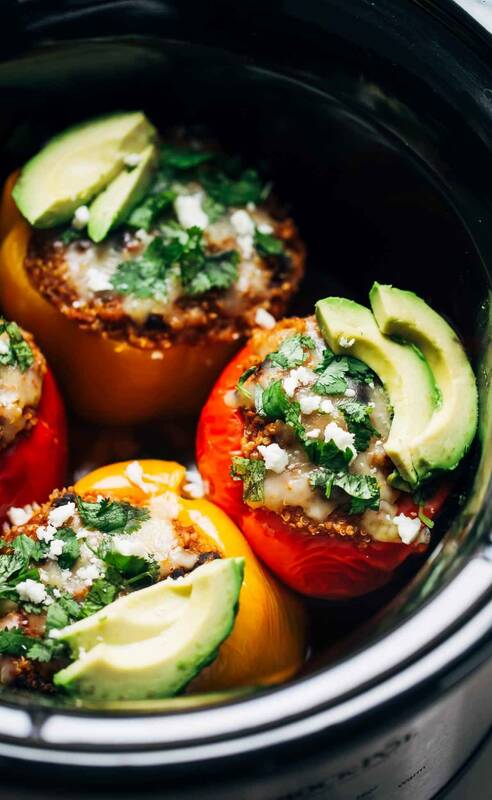 Yes–cooking the quinoa inside the peppers, inside the crockpot–this does make these easy to prep. Love the concept. I don’t use my crockpot enough and this recipe will bring it out of the cupboard.